MIAMI — The cuisine in the surrounding areas of the Everglades National Park is anything but ordinary. From barbeque to Miccosukee traditional food, visitors can find anything and everything that will satisfy even the pickiest of eaters. 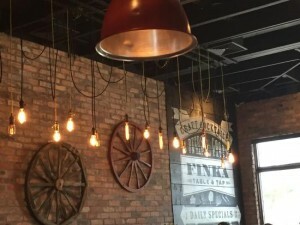 One restaurant that is definitely worth visiting is Finka Table & Tap, located not far from Tamiami Trail as it heads west into the Everglades. Finka’s melding of Cuban, Korean and Peruvian flavors is unique anywhere in South Florida. The independent, chef driven gastro pub is the only of its kind in the far west Miami-Dade area. Restaurants such as Finka, on the edge of Miami and near Everglades National Park, offer a chance to eat on the way to a day in the park or after airboat rides, fishing, or other activities in the area. These places offer a taste of the region and its culture and are a must for out-of-town visitors as well as locals spending a day exploring the park. The head chef and the one who came up with the concept for this restaurant is Eileen Andrade, granddaughter of the original owners of the famous Cuban restaurant chain, Islas Canarias. The upscale-looking farmhouse is huge and is normally is packed to the brim with locals and tourists alike. Bartenders working at the front bar pour craft beers and make signature drinks in Mason jars for the customers. Alexander Aportela is one of the bartenders at Finka. “Every week, the restaurant puts out a different featured drink,” Aportela said. “This week’s is a raspberry mojito and it’s been flying out of here.” Aportela continued, saying how people from all over the world have come to eat at the restaurant after hearing about it in the news or reading articles about it. Aliana Sifuentes has been a server at Finka for the last four months. She says that working at this restaurant has been an experience unlike any other. One dish that is highly recommended, and a customer favorite, is the Cuban Fried Rice. The dish comes with shrimp, banana maduros, pineapple, red peppers and cilantro aioli toped with a fried egg and scallions. If a casual, finger-licking lunch is something you are craving, look no further than The Pit Bar-B-Q. The original owner, Tommy Little, wanted to create a place for travelers to and from the Everglades to stop in and get a cold drink and something to eat. Pulling up to the Pit, you are instantly hit with the sweet, tangy smell of a good, old-fashioned barbeque. Customers have the option of sitting indoors in the air-conditioned dinning room or outdoors on a good old picnic table under a tiki hut roof. Restaurant sign outside of The Pit Bar B-Q (Photo by Stephanie Freire). Mike Rogers has been working at The Pit for two years. He says that anything on the menu will satisfy your taste buds. Word around the block is that the secret to The Pit’s success is the homemade basting sauce and the oak used to grill the meats. 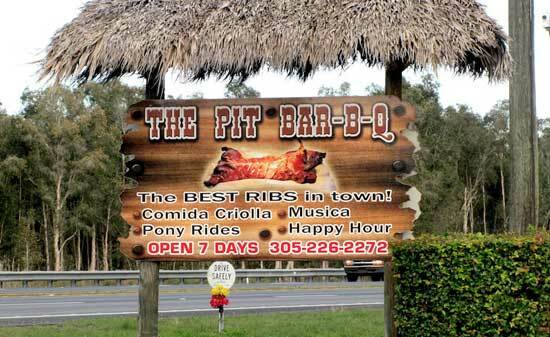 The Pit is famous for their barbecue pork spare ribs and smoked gator bites and also makes slow cooked baby back ribs, New York strip and churrasco steaks, catfish, frog legs and more. Most recently, The Pit has added some Latin food like pork chunks with white rice and black beans, moro rice with yuka, fried plantains, sweet plantains and a homemade tamale in its natural corn husk. What was once just wetlands off of the Tamiami Trail is now a thriving, residential and business area with restaurants unlike anywhere else outside a national park. People have come from all over the world to try the cuisine at both Finka and The Pit. With the two restaurants right outside the Everglades, they make perfect pit stops for tourists to get a taste of the big melting pot that makes South Florida what it is today. Hours: Sundays – Thursdays 11:30 a.m. – 11 p.m., Fridays – Saturdays 11:30 a.m.- 12 a.m.
Start out going east on SW 392nd Street / FL 9336 toward SW 224 Avenue.